The view along the south side of Commonwealth Avenue, looking west from the Boston Public Garden, sometime in the 1870s. Image courtesy of the Boston Public Library. These photos were taken from the same spot as the ones in the previous post, probably even on the same day. 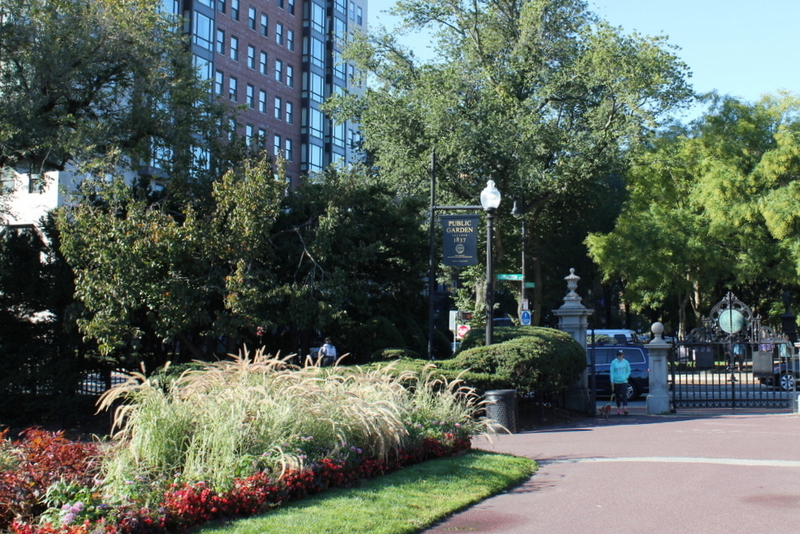 As with the other post, the 2015 view here is mostly obscured by the trees on the Commonwealth Avenue Mall, but beyond the trees many of the historic Victorian brownstones are still standing. Because the Back Bay project began here at Arlington Street and worked its way west, the houses at this end of Commonwealth Avenue are among the oldest in the neighborhood, dating mostly to the early to mid 1860s. The houses in the foreground have since been replaced with a high-rise building, but otherwise almost all of the ones between here and Berkeley Street are still standing, and today they make up part of the Back Bay Historic District on the National Register of Historic Places. 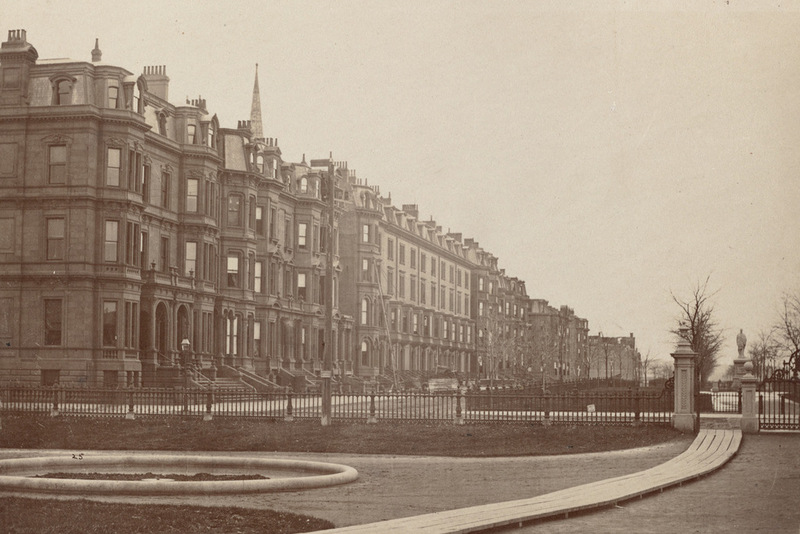 Looking west along the north side of Commonwealth Avenue from the Boston Public Garden, sometime in the 1870s. Image courtesy of the Boston Public Library. 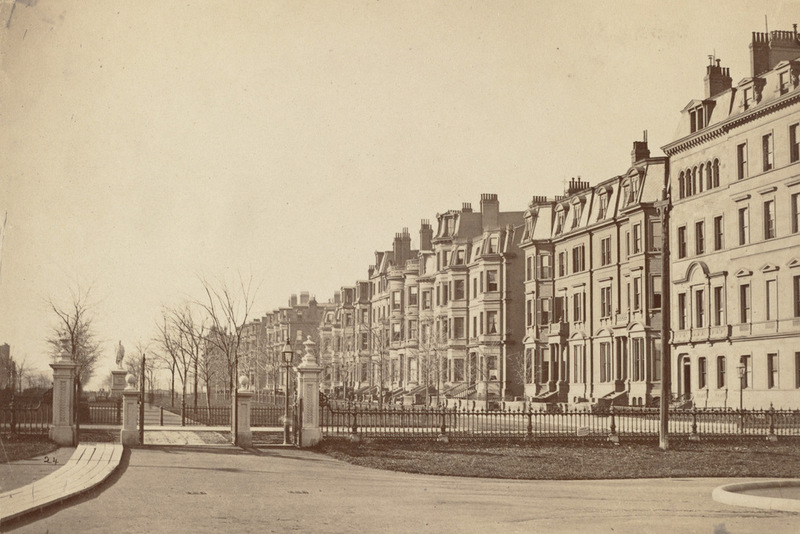 From the start, the Back Bay was designed to be an upscale residential neighborhood, and these houses on the north side of Commonwealth Avenue typically commanded the highest prices. Here, the residents enjoyed the view of the broad Commonwealth Avenue Mall, and their southern-facing front windows gave them plenty of light. The work of filling the land and building homes began here at Arlington Street in the early 1860s, and as the years went on the development moved westward. By the early 1870s, Commonwealth Avenue reached as far as Exeter Street, four blocks from here. Most of the houses in the foreground of the first photo were built in the early to mid 1860s, when the block between Arlington and Berkeley Streets was developed. They represent the typical residential design for the Back Bay, with 3 to 4 story Victorian brownstones lining the streets that had to conform to strict building codes at the time. Nearly 150 years after the first photo was taken, the strict building codes have paid off. The neighborhood retains its original 19th century residential appearance, and many of the houses from the first photo are still standing today. The trees, which were just saplings in the 1870s, now hide the view of most of the houses from here, but a few of the buildings are visible to the right, and are easily recognizable from the first photo.There have been some newer houses, like the light-colored one just to the right of the lamppost, but these have generally been in keeping with the original appearance of the neighborhood. The view of the Boston Public Garden, looking northeast from just inside the entrance at Commonwealth Avenue, taken around 1900. Image courtesy of the Boston Public Library. This statue of George Washington has appeared in several earlier posts here and here, and the scene shows the statue with Beacon Hill in the distance. The only easily recognizable building from the first photo is the Massachusetts State House; the distinctive dome and triangular pediment beneath it can be seen just to the left of the palm tree on the right side of the first photo. The State House is still there, but its view is now blocked by larger trees in the park. Incidentally, if the palm trees in the first photo look out of place in Boston, it’s because they are. Although they are not native to anywhere near New England, tropical plants such as pal trees and the elephant ear plants in the 2015 scene have long been a summer feature at the Public Garden, and in the winter they are stored in greenhouses to protect them from the cold. 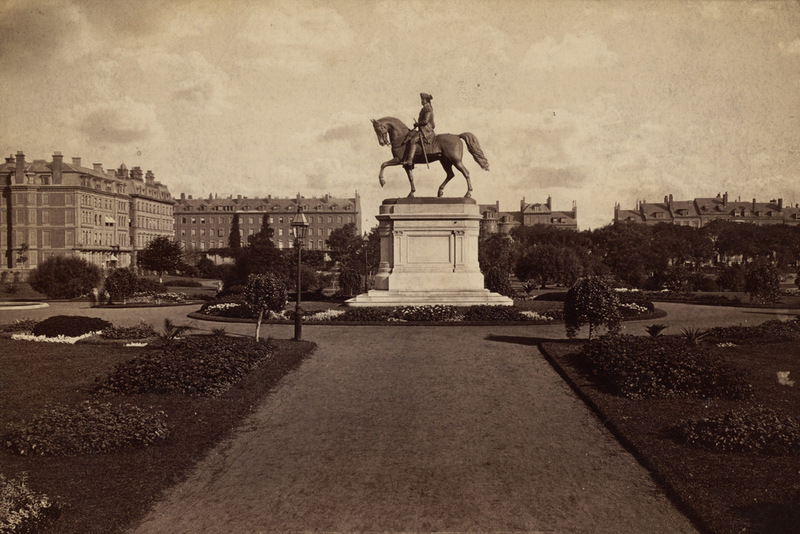 The side view of the George Washington statue in the Boston Public Garden, facing north toward Beacon Street, sometime in the 1800s. Image courtesy of the Boston Public Library. 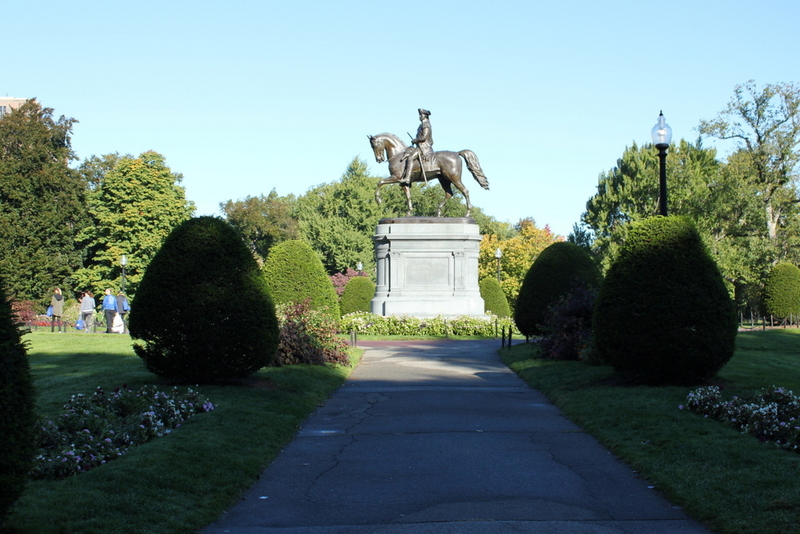 As mentioned in this earlier post, this statue of George Washington has stood at the Commonwealth Avenue entrance to the Public Garden since 1869. It was designed by sculptor Thomas Ball, a Boston native who also designed the Charles Sumner statue in the Public Garden, and the Emancipation Memorial at nearby Park Square. Since then, not much has changed about the statue or the surrounding park. The trees now obscure the view of the houses in the distance, but many of them are still standing today, along Arlington Street to the left and Beacon Street in the center and right. Looking west from the bridge in the Boston Public Garden toward Commonwealth Avenue in 1895. Image courtesy of the Boston Public Library. For as much as Boston has changed in the past 120 years, this scene has stayed remarkably the same. 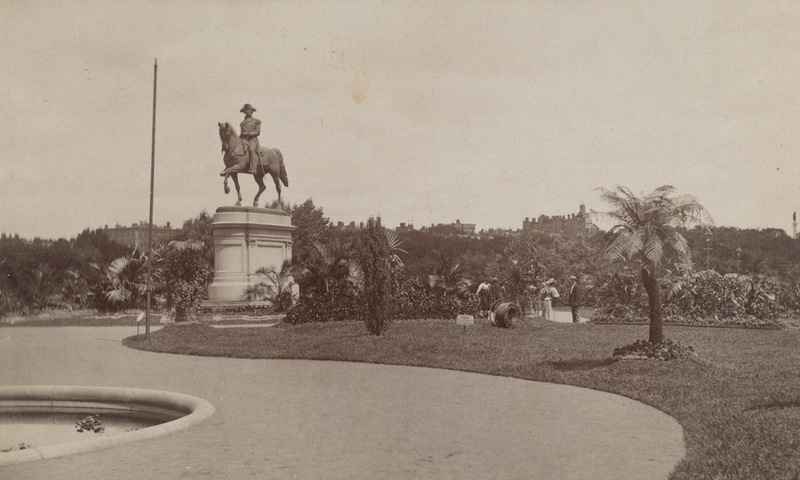 It is taken facing the opposite direction from the photos in this post, and the statue in the distance is the same one visible from the other side in that post. This bridge over the lake has been a feature in the Public Garden since it was added in 1867, and it was designed by noted Boston architect William G. Preston. Two years later, the statue of George Washington was added, and it is one of many statues that decorate the park. 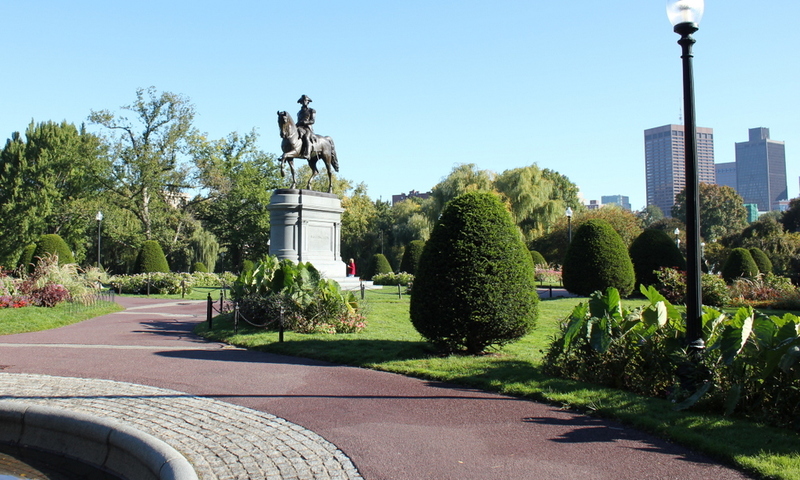 Beyond the Public Garden is the eastern end of Commonwealth Avenue, which was designed with a wide, park-like median. It serves as a major centerpiece for the Back Bay neighborhood, and the townhouses on either side of the street have been highly coveted since the area was first developed. Many of these historic homes are still standing today, although it is hard to see in the 2015 photo here. The ones to the left, at the corner of Commonwealth Avenue and Arlington Street, have since been demolished and replaced by a modern high-rise, but most of the ones on the right are still there, including the ones at the corner. 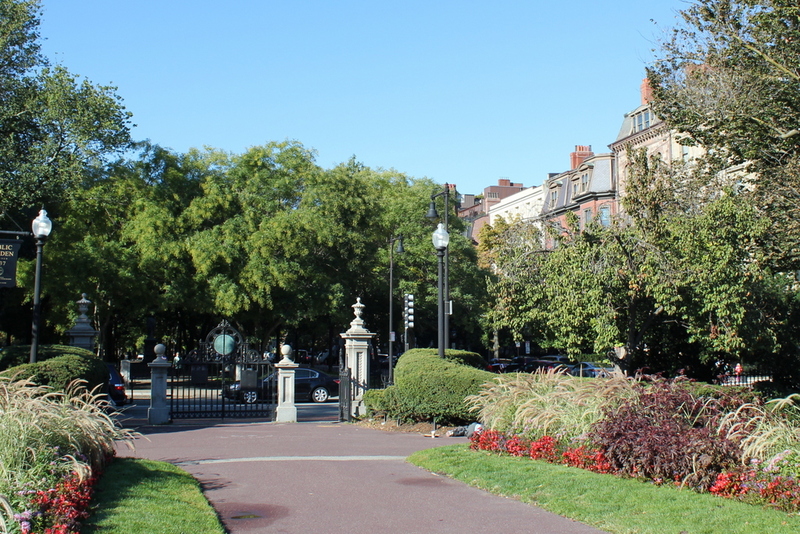 Built mostly in the 1860s, these are among the oldest homes in the Back Bay, and this location along the Commonwealth Avenue Mall and across from the Public Garden has long been desirable real estate in the city. 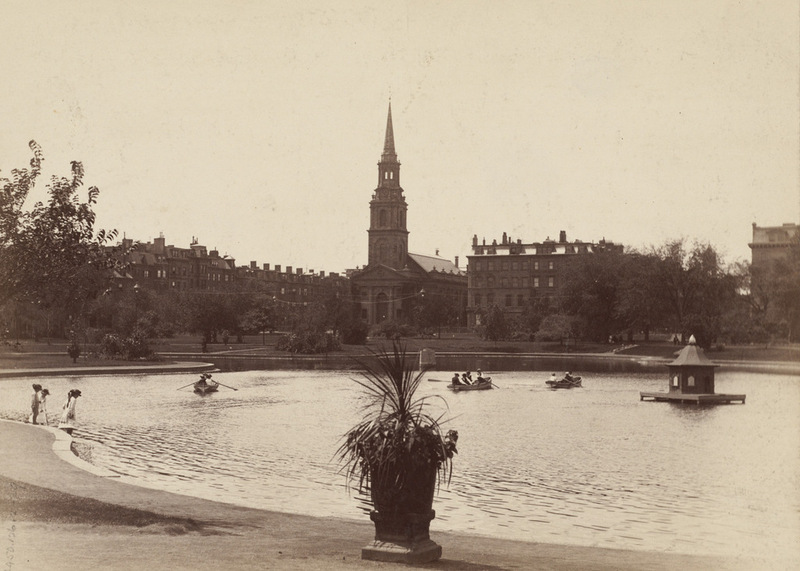 Looking west across the lake in the Boston Public Garden, sometime in the late 1800s. Image courtesy of the Boston Public Library. 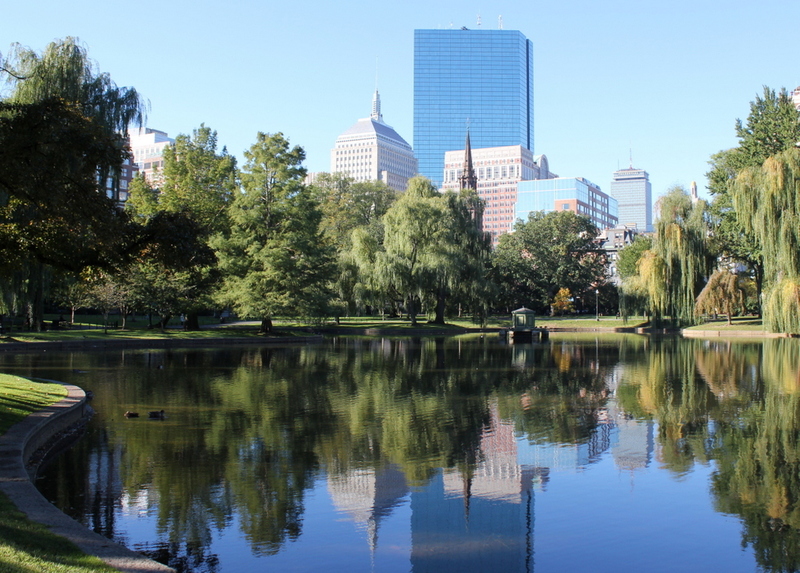 Boston’s Public Garden, as mentioned in this post, was the first public botanical garden in the United States when it was established in 1837. It was located along the edge of the city’s original shoreline, and like the rest of the Back Bay it was a tidal marsh when European settlers first arrived in 1630. 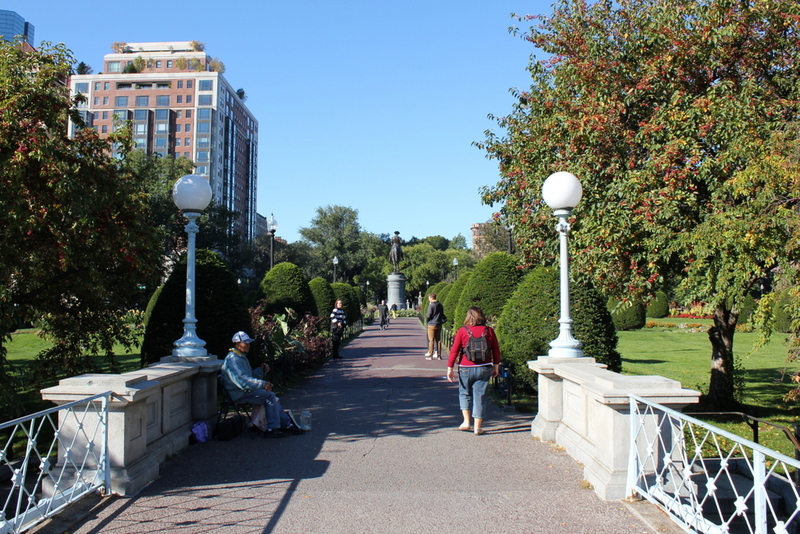 By the 1850s, though, the city was looking to expand west by filling in the Back Bay, and one of the initial projects was the landscaping of the Public Garden, which was done in the early 1860s by landscape architect George Meacham. 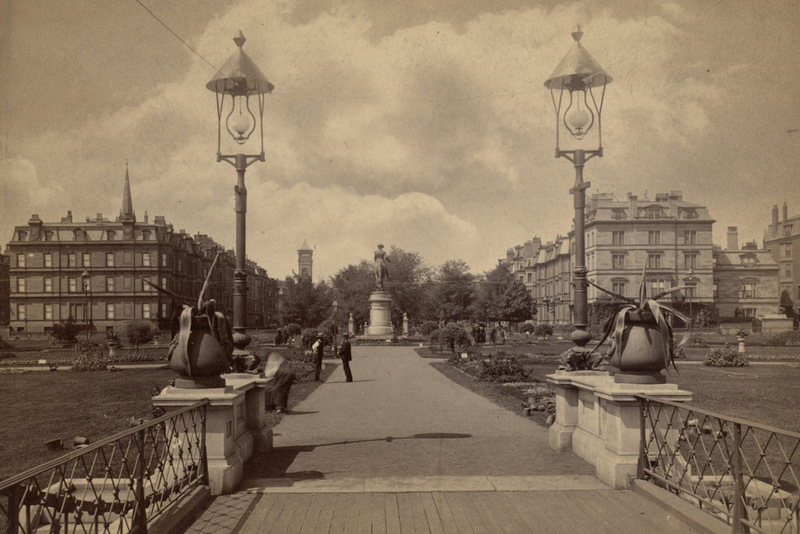 In the years since the first photo was taken, the Public Garden itself hasn’t changed much. It still has the artificial lake in the center, surrounded by walkways, flower beds, and statues. The lake’s famous swan boats are not visible here, but they began operation in 1877 and are still in use during the summer months. Also not visible from here is the bridge over the lake, which was added in 1867 a little to the right of this scene, and is still there today. The greatest difference between these two photos, obviously, is the skyline beyond the Public Garden. When the first photo was taken, the eastern portion of the Back Bay had been developed, and the Arlington Street Church, built in 1861, was the most obvious landmark in this scene. The church is still standing, as are the townhouses just to the right of it along Arlington Street, but otherwise all of the other buildings from the first photo are gone. The buildings to the left of the church are on Boylston Street, and most of the Victorian townhouses were demolished long ago as the street became an important commercial area. In the distance, skyscrapers such as the old and new John Hancock buildings and the Prudential Tower show how the southern section of the Back Bay has been extensively redeveloped starting in the second half of the 20th century.